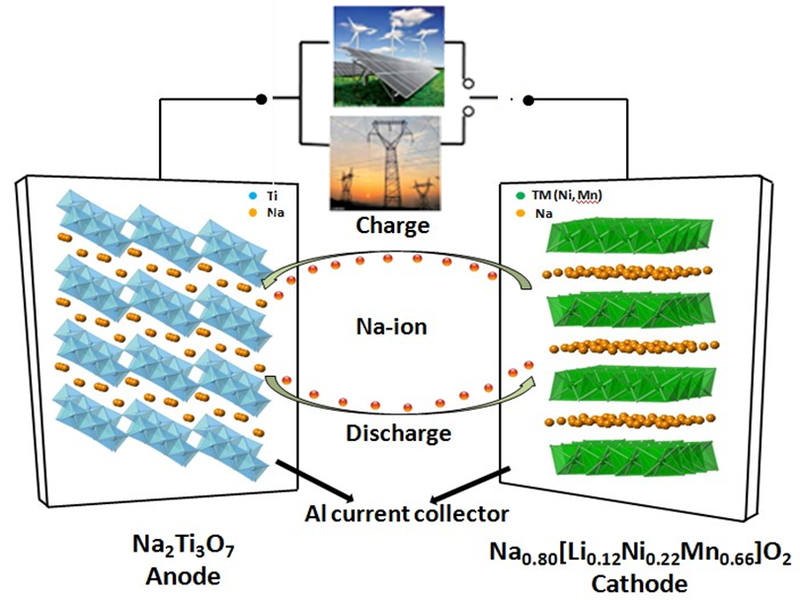 Na-ion batteries have recently gained increased recognition as intriguing candidates for next-generation large scale energy storage systems, owing to significant cost advantages stemming from the high natural abundance and broad distribution of Na resources. Although Na-ion battery materials are not comparable with their Li-ion counterparts which are one of the dominating energy technologies in this decade, there are studies suggesting that Na-ion systems should not be discarded.In particular, Na-ion batteries operating at room temperature could be suitable for applications where specific volumetric and gravimetric energy density requirements are not as stringent as in EVs, namely in electrical grid storage of intermittent energy produced via renewable sources. This would also contribute to a significant reduction of the costs connected to the use of renewable sources, which could then penetrate the energy market more easily and make Na-ion technology complementary to Li-ion batteries for stationary storage. In our current research, both advance cathode and anode materials are developed and studied. In the cathode, Li-substituted layered P2−Na0.80[Li0.12Ni0.22Mn0.66]-O2 is brought out and investigated by advanced techniques such as neutron diﬀraction and nuclear magnetic resonance (NMR) spectroscopy. In the anode, we combine the first principle calculation and X-ray absorption spectroscopy to unveil the intercalation mechanism of Na2Ti3O7. High capacity and power density Na-ion full cell has also been achieved in our lab. We are aiming at discovering high performance materials as well as understanding the energy storage mechanism, which are crucial for the development of Na-ion battery. Among other low cost energy storage alternatives to Li-ion batteries, the Meng group explores several flow battery chemistries. 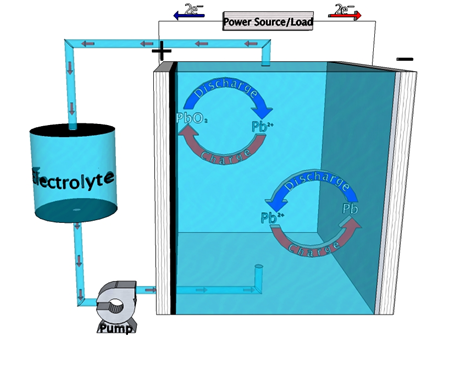 Chief among them has been the soluble lead flow battery (SLFB). Social perception of lead-based products is extremely negative due to their association with an array of adverse health effects. The traditional lead-acid battery is the most highly recycled product on earth, however, trumping tires, paper, aluminum cans, and glass. Through centuries of use, we have had time to very thoroughly discern the harmful impacts of these materials, as well as methods to circumvent those negative aspects. A vast infrastructure currently exists to manufacture and sustainably maintain lead-acid batteries, arguably making them the cheapest and most realistic option to implement into grid-level energy storage today, without perverting the market with unsustainable government subsidy. In addition to its thin film work, the Meng lab is also equipped with bulk all-solid-state lithium battery expertise. 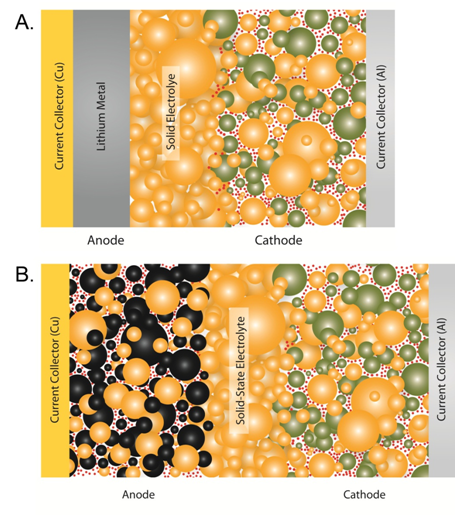 Because solid-state electrolytes (SSEs) are non-volatile and non-flammable, bulk all-solid-state batteries can endure much harsher conditions than a conventional Li-ion battery without the fear of catastrophic failure. This attribute makes solid-state batteries particularly well suited for transportation applications. To provide a practical energy density (Wh kg-1) for such applications, bulk all-solid-state batteries are nearly an order of magnitude thicker than thin-film batteries. The primary SSE for thin-film batteries, Li3+xPO4-xNx (LiPON), has too low of an ionic conductivity for use in bulk all-solid-state batteries because its ionic conductivity is only 2.0 x 10-6 S cm-1 at room temperature. For this reason, the Meng lab’s expertise primarily entails the synthesis, densification, and characterization of state-of-the-art SSEs with ionic conductivities exceeding 10-3 S cm-1 at room temperature. Synthesis techniques at our disposal include mechanochemical planetary ball milling, melt-quenching, and high temperature solid-state reactions under both inert and vacuum environments. Regarding the densification of SSEs, the Meng lab has access to a spark plasma sintering machine as well as a hot isostatic press. Finally, the electrochemical properties of SSEs can be measured using standard electrochemistry equipment (Arbin and Solartron) and special Ti-PEEK test cell dies. The synthesis of each class of SSE comes with its own unique set challenges. For example, oxide ceramics like Li7La3Zr2O12 (LLZO) and Li1-x-yAlxMyM2-x-y(PO4)3 (LAMP) must be sintered in order to minimize interfacial grain boundary impedance. On the other hand, Li2S-P2S5 based glass-ceramics have very low interfacial grain boundary impedance. Unfortunately, sulfide based electrolytes tend to be extremely hydroscopic and must be handled only in inert environments. Anti-perovskites inherit the challenges of both the oxide and sulfide SSEs. The zinc air fuel cell is a promising energy storage cell because of its high specific energy, aqueous and nonflammable electrolyte, and zinc’s abundance. A functional zinc air fuel cell is composed of three parts: 1) zinc metal as the anode; 2) separator; and 3) an air electrode as the cathode. In this cell the cathode contains a gas diffusion layer and a catalyst layer. Since the oxygen reaction is sluggish, it is important to find a suitable catalyst that can accelerate this reaction. Currently, the catalysts used to facilitate both the oxygen reduction reaction (ORR) and the oxygen evolution reaction (OER) are extremely expensive. Therefore, in order to commercialize this system alternatives such as metal oxides are of specific interest. 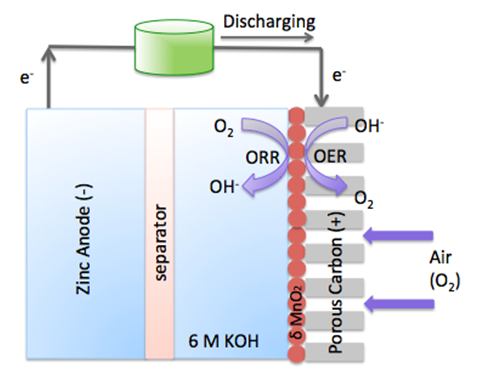 In this research, we are interested in developing cost-effective, high electro-catalytic, and phase stable oxide catalyst which can enhance the OER and ORR. Furthermore, we are also focusing on the characterization and mechanism of both the zinc air fuel cell and catalyst. Magnesium-ion batteries have been proposed as a potential alternative to Li-ion secondary electrochemical cells. Advantages include lower cost and higher abundance of Mg than Li as well as a higher theoretical specific volumetric capacity compared to Li. However, many problems preclude the widespread use of this new technology. These include poor cyclability, low voltage-stability window compared to Li, and use of complex, expensive electrolytes. To mediate these issues, optimization of Mg-ion battery components has become a hotbed of scientific research. Much of the difficulty in Mg-ion systems that utilize Mg metal as an anode is that a passivation layer forms on the Mg surface, preventing deposition of Mg ions. Therefore, research has been directed at preventing or circumventing this layer. We are currently working to mitigate the aforementioned problems by developing state-of-the-art organic and inorganic cathodes as well as utilization of various electrolytes. For instance, intercalation materials beyond Chevrel-phase Mo6S8 are being tested for improved specific capacity and cyclability. This includes highly porous zeolithic type materials as well as conventional intercalation materials. In addition, recent studies have exemplified the use of non-conventional electrolytes to achieve reversible deposition/dissolution of electroactive Mg-ions. To fully characterize our novel systems, we utilize a number of different techniques. This includes SEM, optical microscopy, XRD, FTIR, as well as various electrochemical experiments.